Next day in Ars Electronica, I presented three live software from the Real Time Rome project in the Pixelspaces session organized by Pascal Maresch. I presented with Carlo Ratti who showed the work of the Senseable City Lab at MIT. Other presenters were Toshio Iwai, Horst HÃ¶rtner from the Futurelab, and Andrew Shoben from Greyworld.org. I call these software live because they constantly get data from a remote server while they are running. In the case of Real Time Rome software there are three machines connected to each other: the laptop that presents the visual work, the MIT server where the database and the parsed data lives, and the Telecom Italia server in Rome that spits out the data from the Rome GSM network. Because this type of software is hard to maintain, we show movies from the software in the Ars Electronica Center exhibition. 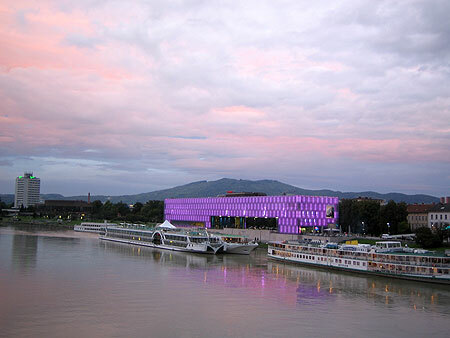 When I left the Ars Electronica Center, I came accross this romantic view of the Linz Kunstmuseum from the bridge.